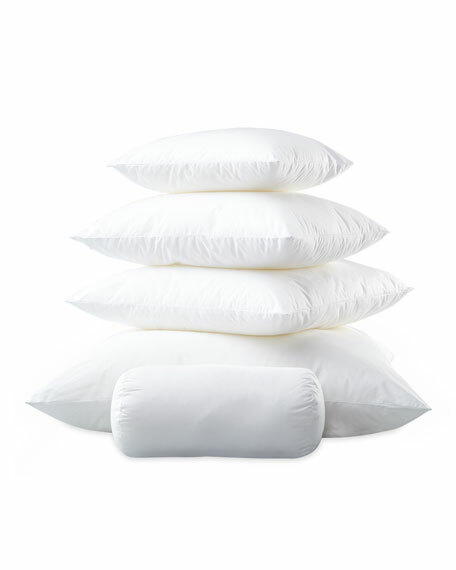 Matouk Montreux Firm Boudoir Pillow, 12" x 16"
Firm boudoir pillow with cotton percale shell. EXCLUSIVELY AT NEIMAN MARCUS Solid velvet boudoir pillow. 1" top stitch flange on all sides. Feather/down fill. Polyester. Spot clean. EXCLUSIVELY AT NEIMAN MARCUS Solid velvet boudoir pillow. 1" top stitch flange on all sides. Feather/down fill. Polyester. Spot clean. 13" x 20". Made in the USA of imported materials. EXCLUSIVELY AT NEIMAN MARCUS Diamond textured boudoir pillow. Solid back with zip closure. Feather/down insert. Silk; dry clean. 13" x 18". Made in the USA of imported materials. EXCLUSIVELY AT NEIMAN MARCUS Boudoir pillow with patterned sides and diamond center. Ball fringe at edges. Faux-silk diamond back. Polyester/viscose. EXCLUSIVELY AT NEIMAN MARCUS Boudoir pillow with patterned sides and diamond center. Ball fringe at edges. Faux-silk diamond back. Polyester/viscose. Dry clean. 13" x 21". Made in the USA of imported materials. EXCLUSIVELY AT NEIMAN MARCUS Boudoir patch pillow with silk welt. Stripe back. Polyester/viscose. Polyester fill. 14" x 20". No zip closure. Spot clean. Made in the USA of imported materials.